BETTER PRODUCTION Shops Using Technology 106 MMS March 2017 mmsonline.com production manager, all of whom had long histo- ries with the company. Today, Taurus has more than 30 employees and manufactures solid, round HSS and carbide specialty cutting tools ranging in diameter from 1 / 8 to 3 inches. The fire turned out to provide Taurus with an unusual opportunity to put into place practices that would bring the company to the level of per- formance the new owners wanted to reach. "We began filling our new facility with technology that would improve workflow, reduce production costs, and promote batch manufacturing capability and tool quality," Mr. Kantak says. 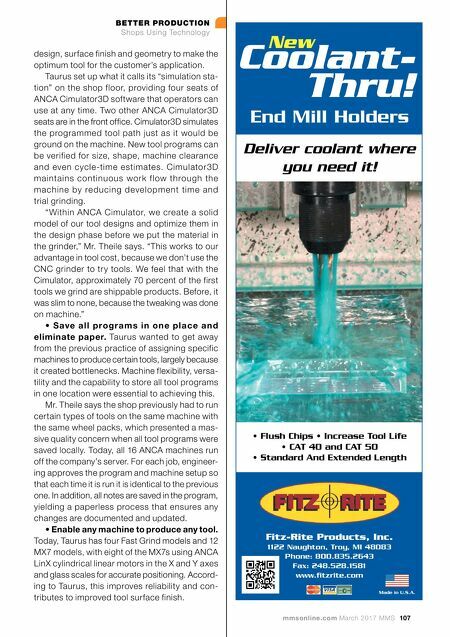 "Pre-fire, we had purchased two ANCA FastGrind CNC tool grind- ers, which represented our company's biggest machine acquisitions in years. The initial reason for the purchases was to integrate the tool pro- duction machines with our computer server so we could save all the programs in one place rather than on multiple machines locally." Today, the shop has 16 ANCA grinding machines. 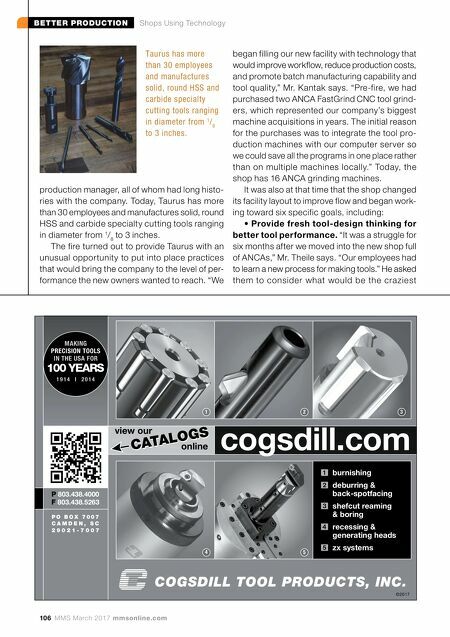 It was also at that time that the shop changed its facility layout to improve flow and began work- ing toward six specific goals, including: • Provide fresh tool-design thinking for better tool performance. "It was a struggle for six months after we moved into the new shop full of ANCAs," Mr. Theile says. "Our employees had to learn a new process for making tools." He asked them to consider what would be the cra ziest Taurus has more than 30 employees and manufactures solid, round HSS and carbide specialty cutting tools ranging in diameter from 1 / 8 to 3 inches. 3 1 2 4 5 P 803.438.4000 F 803.438.5263 P O B O X 7 0 0 7 C A M D E N , S C 2 9 0 2 1 - 7 0 0 7 1 burnishing 2 deburring & back-spotfacing 3 shefcut reaming & boring 4 recessing & generating heads 5 zx systems ©2017 cogsdill.com view our CATALOGS online CATALOGS 100 YEARS 1 9 1 4 | 2 0 1 4 MAKING PRECISION TOOLS IN THE USA FOR COGSDILL TOOL PRODUCTS, INC.